The evening before every race, athlete and coach go out for ice cream. For the competitor, it’s mint chip, if they’re in the States. The coach is happier in Europe, where they serve rhubarb. The best, he says, is found in France. It might be a questionable training ritual while rowing on the elite circuit, but for this athlete and coach, it’s more than a pre-race superstition. The ice cream run is a way for Gregg and Gevvie Stone to shed the labels of athlete and coach and relax into the simpler roles they’ve played for as long as they’ve known each other – father and daughter. It was father and daughter that took to the banks of the Charles in 2008, after Gevvie failed to qualify for the U.S. Olympic team that would head to Beijing that summer. Discouraged, the 2007 Princeton graduate vowed to never row again. Gregg, as fathers do, urged her to stick with it and join him on the weekends, rowing side-by-side, just for fun. At the time, neither Stone realized these 2008 rows were a job interview of sorts. For both. Father fell into the role of coach, as daughter began to emerge as a single sculler of growing achievement, while juggling the training demands of an elite rower with studies at Tufts Medical School. She represented the United States at the World Championships in 2011, 2014 and 2015, where she earned her first international medal – on Father’s Day. She went to London Olympics in 2012, where she finished seventh, then Rio four years later, where—now Dr. Stone—she earned a silver medal in the women’s singles with a time of 7:22.92. “It’s very helpful having somebody who knows the sport,” she said of her father, who rowed at Harvard in the mid-seventies, and then internationally for the United States in the late seventies and early eighties. But for all of the wins and the losses, there have been even more father-daughter moments throughout Gevvie Stone’s competitive career, like the time her father offered what she called “the worst motivation ever”—“No matter what happens, I love you”—or the times she’s fired him, won races, and hired him back after, with no questions asked, in the way only a daughter could. For Gregg, being just her dad has caused an internal struggle as he fights to play both coach and father. But the answer to Gregg’s question is simple, and it’s why Gevvie will be training for the 2020 Olympics in Tokyo in the midst of continuing her medical career. It takes a village to raise an elite rower, and Gevvie is no exception. The Stones work with nutritionists and other coaches to build strength and power, and Gregg Stone the coach is the one who creates practice plans and provides the pre-race pep talks. Gregg Stone the father is the one who keeps his daughter company on rowing trips. It was impossible for Gevvie Stone to avoid rowing. The daughter of two elite rowers – mother Lisa Hansen, competed at the 1976 Olympics – was raised just beyond the banks of the Charles River in Newton, Mass. To the Stone family, the annual regatta on their home water might as well have been Christmas Day, as friends of the family gathered along the course to cheer on the athletes and each other. Gevvie Stone couldn’t avoid rowing – but she resisted it, until her junior spring at Boston’s Winsor School, when, on the school team team coached by her mother, she participated in a seat racing drill and became enthralled with the sport. More than 15 years later, she’s still enthralled with the sport. 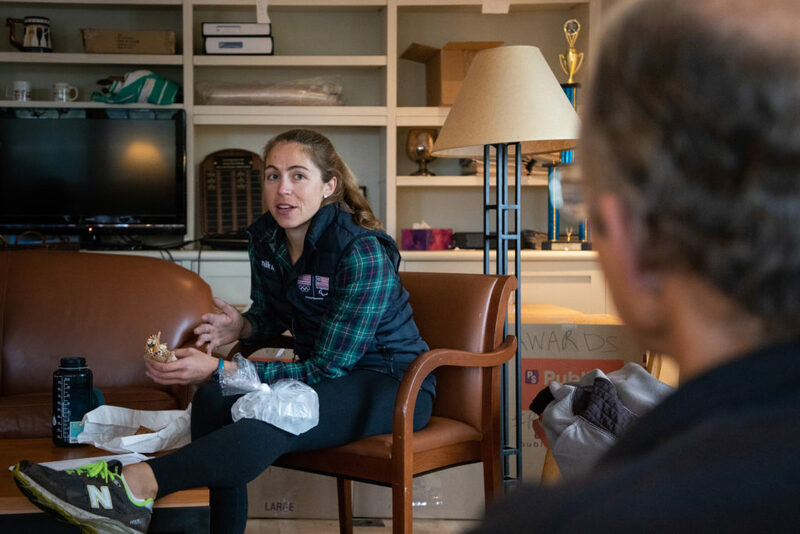 The Head of the Charles women’s singles record-holder will compete for her ninth victory in the race this weekend, after fighting through wind and pure exhaustion last fall to earn her record-breaking eighth win, in the midst of her medical residency. This Saturday, she’ll once again be encouraged from the riverbanks by her coach, her father. And the night before launch, they’ll have ice cream.